Wow, is it already January? A year ago, on January 15th, 2017, I was astonished to hear my name called as the Distinguished Young Woman of Texas for 2017. I legitimately gasped, I was so surprised and excited! I remember getting an email from a scholarship website I had signed up for that mentioned Distinguished Young Women and I thought, not only is it in Houston, which is where I live, it’s also free! I also remember getting the fitness routine…more on that later. I thought a good way to write my blog for this month would be to outline my experiences at the state level as my year comes to a close, so here it goes! My journey with Distinguished Young Women started out at states. There was no local program for my area, so I went at-large to the state program. We started out by learning our self-expression number along with our opening number, which was so much fun, especially for a thespian like myself. I ended out the night crying. The reason? Remember how I mentioned the fitness routine? Well, I’ve been practicing since Thanksgiving when we received the videos and the other participants were talking about certain parts of the routine that I did not recognize. Turns out I had been practicing last year’s routine!! So I cried. Then I went home and learned the REAL routine all in one night. I was so stressed out, but it was worth it! Day 2. The day before the competition. More rehearsals. My thighs. Are. Burning. But I am having so much fun with my new distinguished friends! I loved hanging out, talking about our college plans, and hearing about the talents that everyone will be performing. One girl did something super cool: she worked aa a florist so her talent was doing a whole floral arrangement on stage! Man, was I excited to see that. Day 2 was a lot of work, but Day 3 was going to be the big one. Day 3. Rehearsals. Interviews. Rehearsals. Competition. I spend probably the entire day freaking out. Interviews went better than I expected, with the judges all being very sweet and personable and easy to talk to. Rehearsals, not so well. I was in a lot of pain from all of the fitness rehearsals the day before, but I was making it through. After interviews, a lovely man named Bruce Morgan came to talk to us. He told us all about how amazing Nationals is; how we could gain 50 new sisters and best friends if we won the title! After hearing all about nationals I became more determined than ever to do my best in the competition, so I got my head in the game. I got to share my dressing room with a lovely local winner who calmed me down and made me so much less nervous as we waited for the show to start. It’s so sweet to have girls who support each other at Distinguished Young Women! The show begins and everything goes really well. I kept Bruce’s words in mind throughout the evening, especially as he waited with me backstage before I performed my talent. He told me not to be nervous and that I would rock it. He told me the same thing backstage at nationals. After the competitions were over, the other girls and I waited a good 45 minutes before being called back to the stage. Talk about suspense! After taking home the award for highest score in talent, my name was called as the Distinguished Young Woman of Texas. 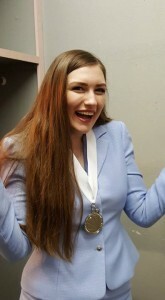 I could not believe it (hence the photo of me in my interview suit freaking out)! The next few hours were a blur: taking photos for nationals, meeting the judges, talking about the next 5 months that I had to prepare for the best two weeks of my life so far! Between learning the wrong fitness routine, shaking in my boots, and not having a local competition, my odds of taking the medallion home looked slim to none. But with confidence, determination, and not forgetting to have fun, I was able to rise above the odds and that is always a possibility for everyone! My best advice for anyone competing at DYW at any level is to be confident in yourself, make friends, and make the most of your time with the program because time will fly! My favorite part about this past year had to have been the people I met. My roommates and host family in Mobile, my fellow thespians, and adults like Bruce whom I will look up to for the rest of my life will never be forgotten. I was able to meet some really adorable little kids through the Be Your Best Self program who were way more excited about eating healthy than I was when I was their age! I got to know Skye Bork who is gracefully representing us this year as the Distinguished Young Woman of America and we are all so proud of her. I learned so much through my time with DYW. I have most definitely grown in my interview and public speaking skills. I am so thankful for the opportunities that Distinguished Young Women have given me. It really isn’t about the scholarship money, though that has been more than helpful to me and my family. It’s about making connections, being your best self, and having the time of your life with tons of different types of people! My myth busters will be a little different this time around: Myth Busters: Distinguished Young Women edition! Myth #1: DYW is a scholarship program, so it costs a lot of money to participate. Fact #1: All I had to pay for to compete was my dress for self-expression. There are no fees to compete whatsoever, at the local, state, or national levels! Myth #2: If I don’t work out right now, there’s no way I can win at any level. Fact #2: I am living proof that you don’t have to be a fitness guru to win. While living a healthy lifestyle is important, you don’t have to be an avid exerciser in order to win a title. I found myself with very little time to exercise during high school, so I was very afraid to go into the state program and make a fool out of myself in the fitness competition. I feel like I made up for it in the other areas of competition and I am proud of myself for having the confidence to get up on a stage and do a fitness routine in front of people! Myth #3: If I don’t win, I failed. Fact #3: Competing at Distinguished Young Women, at any level, is a win in itself. It takes so much work to leave everything you have out on that stage. I came back empty handed from nationals, but what I gained was friendship and a new sense of confidence. I performed in front of thousands of people! That’s really cool! I was terrified to mess up, and I did! On a live stream for everyone to see. I knew my chances of taking any scholarships home were little to nothing. But I knew I didn’t fail because I had 50 girls on my side, rooting for me. You may not have 50 girls at your state or local level to cheer you on but no matter how many there are, they are there for you! DYW girls are some of the sweetest, smartest, and most passionate people on the planet, and getting to know each other was a win in my book. For the last time, I am the current Distinguished Young Woman of Texas, Peyton Wood!